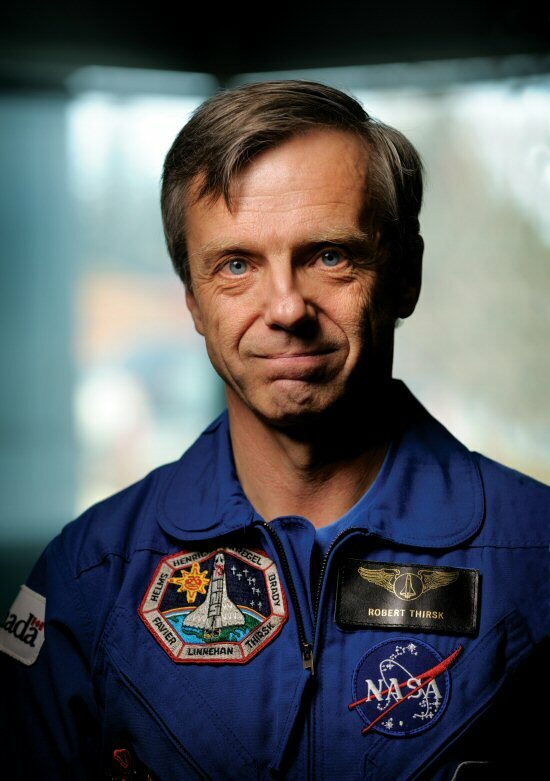 Former Canadian astronaut and University of Calgary alumnus Dr. Robert Thirsk has been named the University of Calgary's 13th chancellor. Thirsk was unanimously elected to the position by members of the university's Senate today, and his four-year term as leader of the Senate and ceremonial head of the university will begin July 2. Media will have an opportunity to meet the new chancellor-elect today at 1:30 p.m., please see details below. During a long career with the Canadian Space Agency, Thirsk spent more time in orbit than any other Canadian. His passion for space, research and education has engaged many Canadian young people in science and engineering. One example of this engagement is Tomatosphere - a program that Thirsk founded that sends seeds into space and then provides them to schools to use in experiments. Thirsk is also the co-leader of an international team investigating the effect of space travel on the human nervous system and is an adjunct faculty member at the International Space University in Strasbourg, France. "Robert Thirsk has been a hands-on member of our university community for many years," said outgoing Chancellor Jim Dinning. "Bob's long list of accomplishments, his integrity, and his passion for research and education will inspire students, faculty, staff and alumni for generations." Thirsk graduated from the Schulich School of Engineering at the University of Calgary in 1976 with a bachelor's degree in mechanical engineering. In 1985, he received the University of Calgary's inaugural Distinguished Alumni Award, the university's highest alumni honour recognizing career achievements for members of the university's alumni family. He received an honorary doctorate in 2009 during a live satellite uplink with the International Space Station, where he lived and worked for six months. "My education at the University of Calgary gave me the solid foundation I needed for my career," said Thirsk. "Serving as chancellor will be an honour and my way of showing my gratitude to students, faculty, staff and alumni. I think the best thing anyone can do is invest in education, and I am looking forward to helping find ways to make a great institution even better." Chancellors are passionate ambassadors for higher education who chair the University of Calgary's Senate, work to enhance the university's position in the community, represent the public's interest at the university, and encourage the pursuit of excellence and the recognition of the university's essential role in society. The chancellor represents the university at ceremonial occasions, presides over convocation ceremonies and confers degrees on behalf of the Senate. The chancellor is an ex-officio member of the university's Board of Governors. Elizabeth Cannon, University of Calgary president and vice-chancellor, said Thirsk will play a pivotal role in celebrating the university's 50th anniversary and in supporting the Eyes High strategic direction to become one of Canada's top five research universities by 2016, where research and innovative teaching go hand in hand, and where the university fully engages the communities it both serves and leads. "I am thrilled that Bob is the University of Calgary's new chancellor and look forward to seeing how his incredible personal accomplishments and deep commitment to this planet's young people will inspire our entire university community," said Cannon. "He will make an excellent community ambassador for our university's bold and ambitious journey through 2016 and beyond." Cannon also thanked current chancellor Jim Dinning, who remains in his position until June 30. "It's been a pleasure to work with Jim over the past four years," said Cannon. "I want to express the deep appreciation of the entire community for his enthusiastic support of the university and his dedication to advancing post-secondary education." Thirsk is available for media interviews this afternoon. WHEN: Friday, May 9 at 1:30 p.m.
To view the photo associated with this press release, please visit the following link: http://www.marketwire.com/library/20140509-800uoc.jpg.